For better or worse, the 35mm film format has become the standard against which all other file/sensor formats are compared. 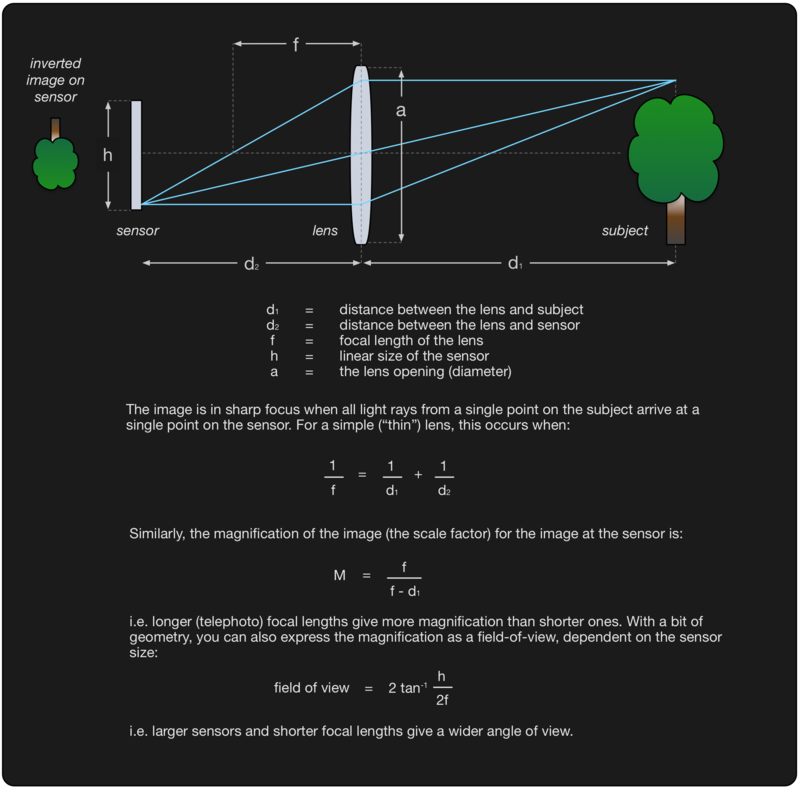 But understanding how to achieve identical images from cameras with different sensor sizes – i.e. images equivalent to a 35mm “full-frame” camera – is very useful if you use several different formats. 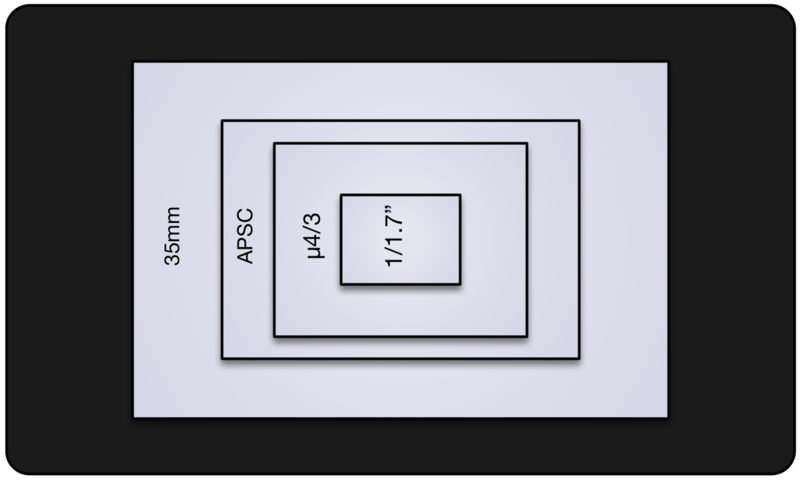 To do this, there is the need to define a “crop-factor” as the ratio of the sensor size between two different systems (for example, measured along a diagonal of the sensor). The resulting images will have the same field-of-view, the same depth-of-field, and the same pixel-level image noise when taken at the same shutter speed. They will be identical. An important take-away is that there is no inherent advantage to using a larger sensor format if (for example) you are shooting street photographs with a full-frame equivalent aperture of f8. Assuming that there are no lens quality or ergonomic problems, a good compact camera can give similar results to a heavy and bulky DSLR – while also being much more discrete. Another take-away from this is that effectively the only advantage large sensor systems inherently have is the ability to achieve better image quality either through slower shutter speeds or through wider apertures (i.e. with shallower depth of field). You can think of a larger sensor as extending the envelope of parameters that you can shoot with – but the larger sensor does not give better image quality for an equivalent image shot with a smaller sensor. A lot of people online appear very skeptical of such conclusions, and so this article aims to show why, for example, an f1.4 lens both is and is not an f1.4 lens when comparing camera systems with different sensor sizes. Read on if you want to see some of the math and reasoning as to why this is so. For most of this article,we are going to assume that the digital sensors used in the different camera formats are equally efficient and have the same number of pixels. i.e. that a full-frame 16MP Nikon sensor performs as well as a 16MP Olympus µ4/3 camera. In the real world there are of course differences in performance, but in practise these are very small. Most contemporary sensors use very similar underlying technology and may even be made and designed by the same silicon vendor. 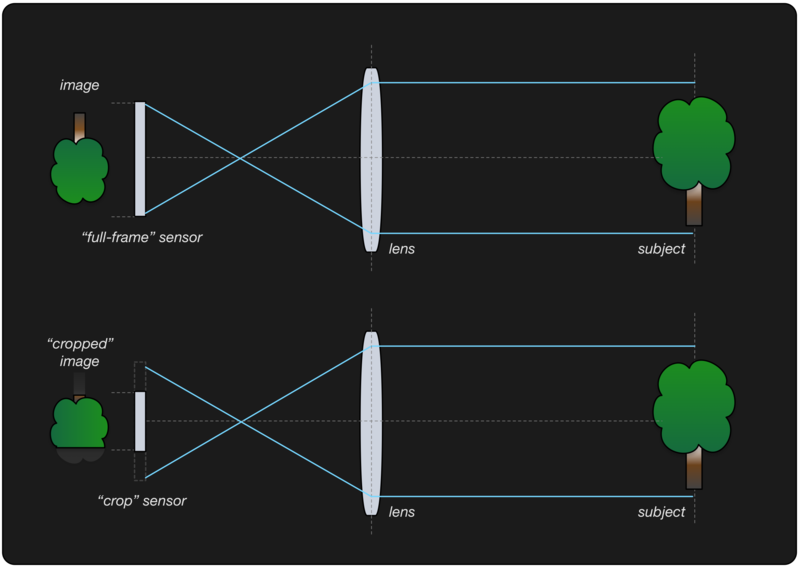 Diagram illustrating the basic features of a camera, formed from a sensor and an idealised lens. The f-stop for the lens is defined as the ratio of the focal length to the aperture (the effective diameter of the lens). Historically this was used rather than the lens opening diameter because it simplified exposure calculations. For example, a 50mm f1.2 lens will have an effective opening diameter of approximately 42mm (which is why, for Geeks, this lens is the ultimate answer for life, the universe and everything…). The good news is that changing the sensor does not change the lens or its properties in any way. As often said, a f1.2 lens is a f1.2 lens, no matter what camera it is mounted on. However, the resulting images do change as a result of using a different sensor. Crop vs Full-Frame cameras with the same lens. If we want to achieve the same framing but still capture the same amount of light with the smaller sensor, we need to change the focal length. The following diagram shows three potential configurations. In the first, the reference “full-frame” configuration is shown. In the second, a crop-sensor configuration with the same same field-of-view and the same total light gathering capacity is shown, and in the third a crop-sensor configuration with the same field of view and f-stop as the full-frame sensor. Note that if we want to maintain the same total light gathering ability we need to keep the same lens diameter. However, because f-stops are defined as the ratio of the lens opening to the (now smaller) focal length, the lens has a much smaller f-stop than before. If we reduce the lens opening so that the f-stops are the same, the total light captured is reduced proportionally. So, for example, a 50mm f1.2 lens on full-frame is equivalent to a 25mm f0.6 lens on a micro-four-thirds camera. They will have the same field of view, the same total light gathering capability (and hence the same image noise at the same shutter speed), and – if you do the math – the same depth of field. 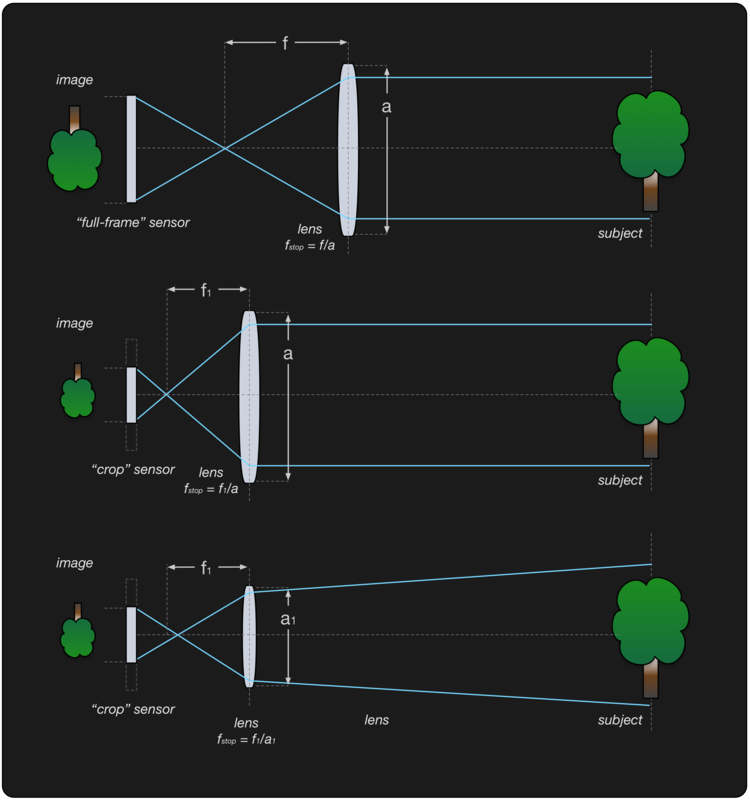 This diagram also illustrates how inverse teleconverters (such as the Metabones SpeedBooster) allow a full-frame lens mounted on to a crop-sensor camera to achieve a smaller effective f-stop. They work by adding an element between the lens and camera that reduces the focal length, allowing the smaller sensor to capture more or all of the light from the full-frame lens. But why does the ISO also change? This is because of the way that sensor/film ISO is defined. The ISO rating of a sensor describes its sensitivity in relation to a given quantity of light per unit area (flux). If you refer back to the original comparison of full-frame and crop cameras, you can see that the intensity of light arriving at the crop sensor will be identical to that of the full-frame sensor. As a result, using the same ISO setting should result in exactly the same shutter speed for each camera. However, the total light captured by the crop-sensor is less. If it has the same total number of pixels as the full-frame sensor, then pixel must be smaller and therefore capture proportionally less light. It will therefore be proportionally noisier due to the lower signal in the signal/noise ratio. The practical upshot of this is that for the same ISO setting a crop sensor will be noisier than a full-frame sensor. This is simply the result of the smaller sensor gathering less light overall, and has nothing to do with the underlying sensor implementations. All the above discussion assumes equivalently performing optics and sensors, which of course is seldom the case. In practical use, smaller sensors tend to be more efficient than larger ones simply because it is easier (cheaper…) to manufacture them. As a result, smaller sensors are often built using newer technologies and perform slightly better than you might expect. For example, current µ4/3 sensors have perhaps half a stop better performance than current Canon sensors. However, this is largely because Canon seem not to have updated their core sensor technology in the last five years, and I would not be surprised if the advantage is reversed when Canon finally wake up and release their next newest/greatest designs. However, such changes are relatively small and often transient – they are rarely large enough in themselves to justify changing camera systems or formats. For a more subjective comparison of three very different real-world cameras, click here. Excellent piece. While I was aware of most of this you’ve put it together in a very useful way. Some people (not street photographers) of course will look at shallow depth of field advantages of a larger sensor but it’s great that you framed this for street photographers shooting at f/8 or smaller apertures as that puts aside the shallow depth of field issue. Hi Richard – yes, unfortunately a lot of internet discussions about sensor size are implicitly or explicitly about the camera as a status symbol rather than a tool for a job. What is remarkable now is how far technology and manufacturing have progressed in the last few decades – to the point that both sensors and optics are now more limited by physics than implementation issues. I am particularly amazed at the optical quality of many of the smaller cameras (the GR being a prime example). I’m a beginner in photography and this article is very good, thank you! Now I understand that the crop factor affects the focal length, aperture and iso, in order to make a full comparison to full frame. Can we easily find the distance we need to reduce to the adapter, in order to maintain the same field of view and amount of light ? I realize I am four years late to this discussion, but I found the article well-written and explained. While I did not understand every single point, I do walk away from the article with a much deeper understanding of how my Nikon and Olympus cameras process light. Thank you.